Two years ago, the Supreme Court gutted the VRA. 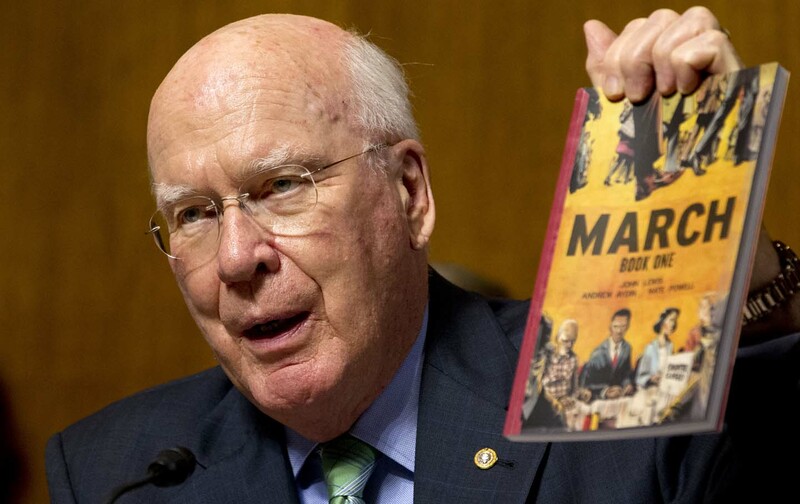 Senator Patrick Leahy and Congressman John Lewis have a plan to fix that. Two years ago, on June 25, 2013, in Shelby County v. Holder, the Supreme Court invalidated the centerpiece of the Voting Rights Act. Tomorrow, congressional Democrats will introduce an ambitious new bill that would restore the important voting-rights protections the Supreme Court struck down. 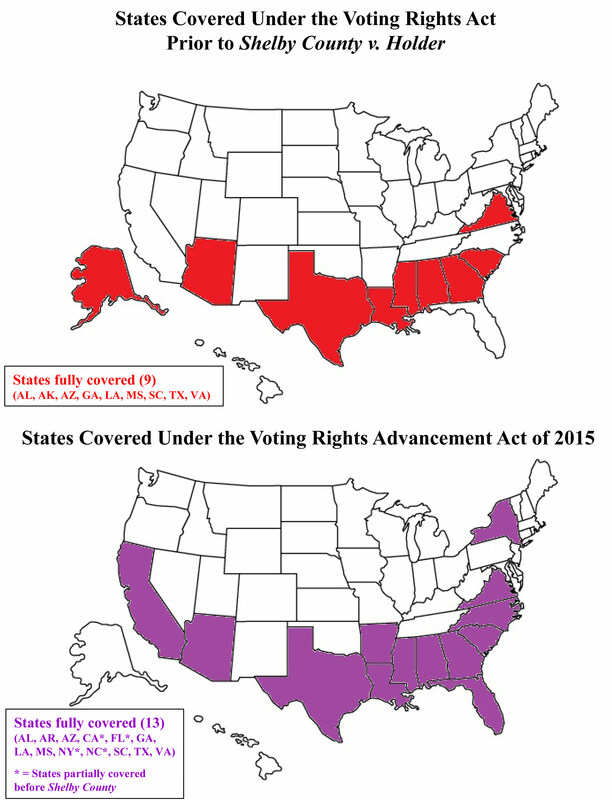 The Voting Rights Advancement Act of 2015 would compel states with a well-documented history of recent voting discrimination to clear future voting changes with the federal government, require federal approval for voter ID laws, and outlaw new efforts to suppress the growing minority vote. The legislation will be formally introduced tomorrow by Senator Patrick Leahy of Vermont, the ranking Democrat on the Senate Judiciary Committee, and leaders of the Black Caucus, Hispanic Caucus, and Asian Pacific American Caucus in the House. Civil-rights icon Representative John Lewis will be a co-sponsor. The bill is much stronger than the Voting Rights Amendment Act of 2014 (VRAA), Congress’s initial response to the Supreme Court’s decision, which garnered bipartisan support in the House but was not embraced by the congressional Republican leadership, which declined to schedule a hearing, let alone a vote, on the bill. The 2016 election will be the first in 50 years where voters will not have the full protections of the VRA, which adds urgency to the congressional effort. Since the Shelby decision, onerous new laws have been passed or implemented in states like North Carolina and Texas, which have disenfranchised thousands of voters, disproportionately those of color. In the past five years, 395 new voting restrictions have been introduced in 49 states, with half the states in the country adopting measures making it harder to vote. “If anybody thinks there’s not racial discrimination in voting today, they’re not really paying attention,” Senator Leahy said. In the Shelby County ruling, the Supreme Court’s conservative majority struck down Section 4 of the VRA, the formula that compelled specific states with a long history of voting discrimination to approve their voting changes with the federal government under Section 5 of the VRA. Section 4 covered nine states (Alabama, Alaska, Arizona, Georgia, Louisiana, Mississippi, South Carolina, Texas, and Virginia) and parts of six others (California, Florida, Michigan, New York, North Carolina, South Dakota) based on evidence of voting discrimination against blacks and other minority groups dating back to the 1960s and 1970s. The Voting Rights Advancement Act restores Section 5 of the VRA by requiring states with 15 voting violations over the past 25 years, or 10 violations if one was statewide, to submit future election changes for federal approval. This new formula would initially cover 13 states: Alabama, Arkansas, Arizona, California, Florida, Georgia, Louisiana, Mississippi, New York, North Carolina, South Carolina, Texas, and Virginia. (The VRAA of 2014 covered only Georgia, Louisiana, Mississippi, and Texas.) Coverage would last for a 10-year period. These states account for half of the US population and encompass most of the places where voting discrimination is most prevalent today, like Florida, North Carolina, and Texas. The new formula includes the Southern states that were initially targeted by the VRA, where discrimination against African-Americans remains a disquieting problem, along with diverse coastal states like California and New York, which have more recently discriminated against ethnic groups like Latinos and Asian-Americans. In the Shelby County opinion, Chief Justice John Roberts faulted Congress for not sufficiently updating the VRA’s coverage formula after 1965. Now members of Congress have proposed doing just that. The new bill is a fairer, more modern, and more data-driven approach to solving the problem of voting discrimination, and undermines the argument that the VRA targets only the South. “It’s clearly better than what existed before,” Yale Law School Professor Heather Gerken told me. The bill would also help voters in other tangible ways, by giving the attorney general the authority to send federal observers to monitor elections in places where DOJ believes there’s a risk of voting discrimination; making it easier to win a preliminary injunction against a potentially discriminatory voting change; requiring public notification of any voting change within 180 days of an election; and allowing courts to “bail-in” jurisdictions not covered by Section 4 for federal supervision if there’s a judicial finding that a voting change has a discriminatory effect. Unlike the VRAA, the new bill does not exempt voter-ID laws from counting as a voting violation. The legislation faces an uphill road in Congress. Few Republicans were willing to support the more modest VRAA, even after the historic 50th anniversary of Bloody Sunday in Selma. Leahy could not find a GOP co-sponsor in the Senate for the old bill or the new one. That’s a sad development, given that the VRA has always had strong bipartisan support, and the 2006 reauthorization of the law was approved 390-33 in the House and 98-0 in the Senate and signed by George W. Bush. “A decision has been made within the Republican Party that we’re not going to do anything,” Leahy said.